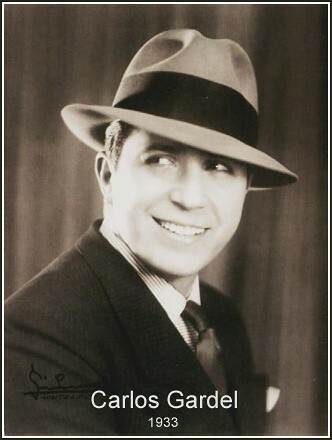 Carlos Gardel is by far Argentina’s most famous Tango singer and is a nationally adored figure. 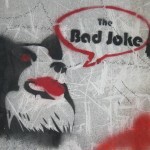 They say that if you’re itching to get into a fight with an Argentine, just insult any one of their holy trinity of heroes: Diego Maradona, Evita, or Carlos Gardel. Carlos Gardel was born Charles Gardes to single mother Berthe Gardes in Toulouse, France in 1890. To escape the social stigma of having a child out of wedlock, Berthe migrated to Argentina, claiming to be a widow. While we take these facts for granted today, Gardel’s origins were something of a mystery for many years: speculators argued over whether he was born in Uruguay, France, or Argentina. This uncertainty only added to the mystique of the tango legend; similarly foggy are details of his love life and of his death. Ms. Gardes and son, nicknamed Carlos, settled into the barrio (neighborhood) of Abasto. As as a child, Carlitos worked in opera houses (Buenos Aires had five at the time, of which the Teatro Colon is the surviving example) organizing props, lifting curtains, and even rousing audiences as a professional applauder. Inspired by the most important singers of the time, Gardel built his name singing in bars, horse races, and for private parties across Buenos Aires. He was ultimately launched to fame by the fates of tango when he performed one of the first tango songs known to have lyrics, Mi Noche Triste (My sad night) in 1917. The recording exploded across the Americas and established Gardel as tango’s original singer. In 1935, Gardel and Le Pera were promoting their newest film, El día que me quieras, when their plane crashed during take-off in Medellín, Colombia. Neither artist survived. Gardel’s body was carried across Colombia, by steamboat to New York, Rio de Janeiro, Montevideo, and back to Buenos Aires. Huge street processions met the coffin in each city to mourn the loss of “Carlitos”. 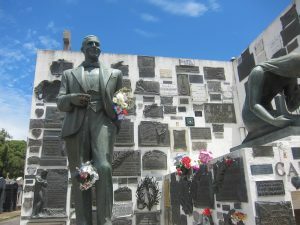 Gardel is buried with his mother, in the Cemetery of Chacarita. His grave, declared a National Monument by the late President Néstor Kirchner, boasts plaques of memorial from admirers around the world. Taxi drivers are known pull up next to his grave, play a tango at full blast, and light a cigarette. When the song is over, the driver places what’s left of the cigarette in the statue’s hand. Fans also tuck a rose into the statue’s lapel, so Gardel remains ever debonair. Since his death, Gardel’s memory persists such that there’s even a common saying, “cada día canta mejor”: he sings better every day. It must be true, since in 2003, UNESCO declared Gardel’s voice to be Patrimony of Mankind. Carlos Gardel was a true man of the arrabal, meaning a working-class neighborhood on the outskirts of the city. In his time, Abasto marked the edge of the city, populated mainly by Italian immigrants, and life revolved around a market fair which brought produce from the country to the city. 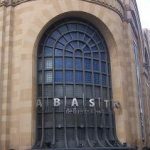 Eventually, the Mercado del Abasto, a beautiful Art Deco building, was built to house the fair. Though the building now contains a shopping mall, it’s a stunning jewel in Buenos Aires’s architectural pantheon. Today, almost everything here is named after Gardel, from streets to cafes, and even newspaper stands boast the name of “El morocho del Abasto” (“The dark one from Abasto”). Tango fans will find this part of town worth visiting. Take a stroll down the Pasaje de Zelaya, a short pedestrian walk full of images of Gardel, and song lyrics on the walls and sidewalks. Two of Buenos Aire’s best alternative theatre spaces are also on this walk: El Cubo and Teatro Ciego, the blind theatre company! While shows at either of these venues are entirely in Spanish, they sometimes show dance productions or musical (and other sensory) works. Turn the corner onto Jean Juares and enjoy houses decked out in fileteado artwork, the popular decorative art found on shop windows, buses, and sign posts around BA. 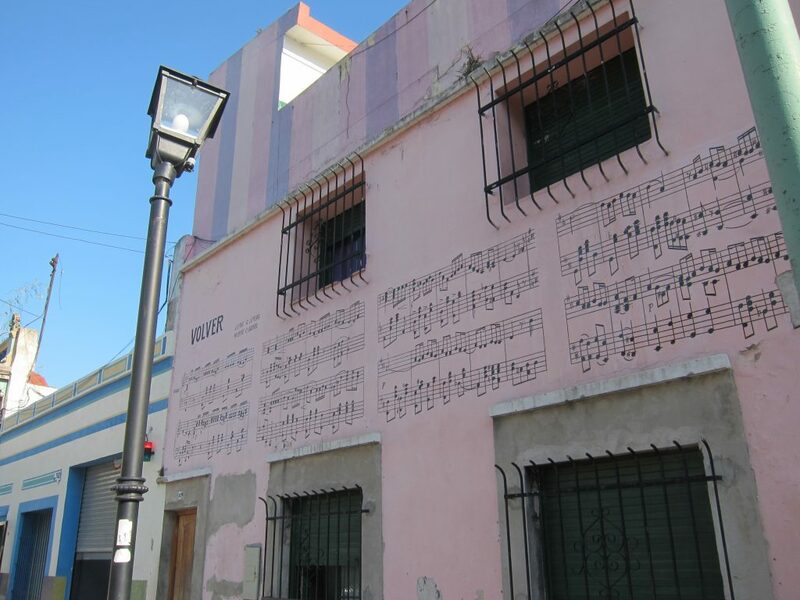 After one block you’ll find the Carlos Gardel Museum, which was the singer’s (and his mother’s) home. The museum shows relics of Carlos’s life, and often hold events and shows. If you’re lucky, you may stumble upon a tango lesson or music performance! 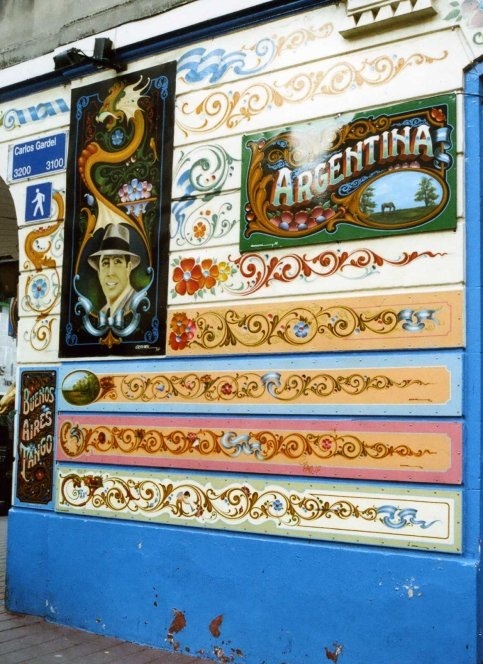 Then check out the Carlos Gardel pedestrian street, where you’ll find a statue of Gardel, posing under the Abasto’s arches, plus a tourist shop called “Regionales del Abasto”, worth visiting if only for the extraordinary fileteado artwork on the walls, as pictured here. Note that even the subway stop for this part of the city is named Carlos Gardel. Luca Prodan, another late Argentine music legend, also lived in Abasto, and in the song Mañana en el Abasto, he sings about waking up in this ‘hood, sleeping in the abandoned Abasto building in the late 1980’s, then taking the subway from the Carlos Gardel station. For more information on Gardel, listen to this piece on NPR or read on Rhythm Planet about a chance meeting between Carlos and Frank Sinatra! 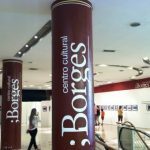 Finding Borges Follow US writer Pat Gillespie as he tries to hunt down traces of the legendary Argentine writer Jorge Luis Borges across the city of Buenos Aires, from San Telmo in the south all the way to Palermo in the north. Chiqué Tango Milonga Looking to tango along with the locals in Buenos Aires, the tango capital of the world? Head to Chiqué Tango Milonga on a Thursday afternoon for an authentic display of tango in its natural environment. 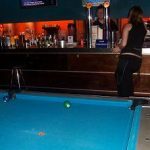 Bull Bar (ex Deep Blue) Shoot pool, sip cocktails or enjoy your own personal beer tap at Deep Blue, an upscale bar frequented by the after-office crowd. 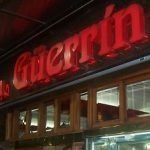 Located in the City Center, with other locations in Puerto Madero and Olivos.